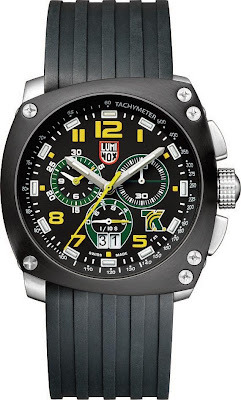 Recently, I went looking for a new watch that would be stylish yet rugged and found an eye catching and attractive design in the racing-inspired Luminox Tony Kanaan watch(above). It boasts all the signature features of the Luminox brand, including perfect visibility and continuous illumination provided by the proprietary Luminox Light Technology, superior water-resistance and bold construction. This watch was designed by famed Indy Race driver - Tony Kanaan.Instead of just being a watch with a famous racer's name on it, Kanaan (being a major watch lover), and Luminox worked really closely together on the design and production process, and approved every feature of the new watch, from the whole design to every minor detail so this really makes for an authentic race car driver's watch. While Tony could have easily worked with a number of higher-end brands, he really wanted to make sure that his friends could afford the watch with his name on it. His friends were working with brands like Audemars Piguet - and while they created some beautiful timepieces, they didn't make a lot of sense for the fans with prices around $70,000. The first Luminox Tony Kanaan watch featured the driver’s signature colors - bright blue and orange. The black dial features orange numbers, while the chronograph sub-dials are surrounded by bright blue. At 4 o’clock, you will notice the Tony Kanaan logo. The updated version I bought features the new Green and Yellow racing colours of Tony Kanaan's new race season. The new sandwich-construction case, 44mm in diameter, is of asymmetrical design. The chronograph watch incorporates a black PVD steel top fitted with six satin-finished screws, a black steel bottom and a middle part crafted in black carbon fiber. 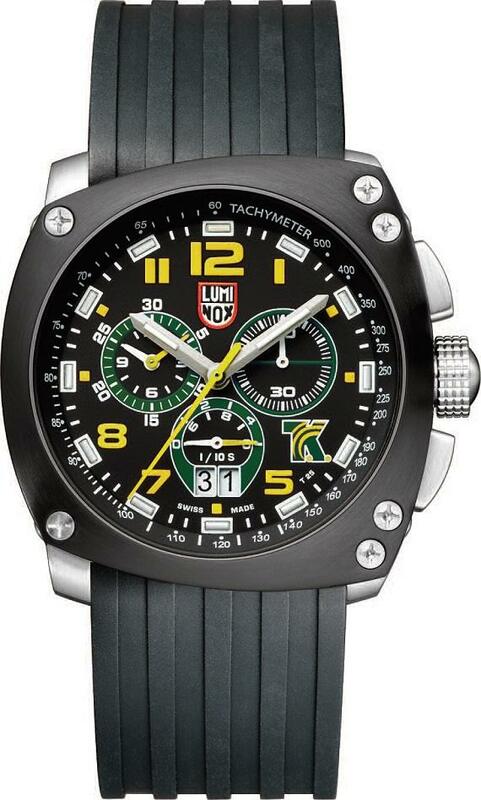 The new Luminox Tony Kanaan watch is available with either a racing tire-pattern rubber strap or a padded black leather strap featuring yellow contrast stitching and green backing. Luminox uses a sophisticated movement setup in the watch that isn't your standard 12 hour chronograph. They use a precision Swiss made Ronda movement, and it is a 1/10 of a second chronograph. The subdial on the left of the watch has two hands - for the hours and minutes. The subsidal at 6 o'clock is the 1/10 of a second indicator, while the subdial on the right of the dial is for the main time seconds. As a racing watch, of course it is going to have a tachymeter scale on the flange ring. On the dial is also Tony's "TK" logo. Glowing tritium gas tubes are placed in the hands, and around the periphery of the dial next to the hour indicators. The watch crystal is sapphire with AR coating, and the case is water resistant to 100 meters. As a second release of the Luminox Tony Kanaan watch, Luminox changes the colors on the dial because Tony changed the colors of his helmet. The watch now has a yellow and green tint to the dial. Luminox fans realize that this pieces is totally unique in the entire Luminox collection - as it is not based on a standard model. Inside the watch is a Swiss quartz chronograph movement with a big date complication at 6 o'clock. The dial is large and bold, and quite sporty. Not just in the "active" sense of the world, but actually feels like a watch that fits into the world of professional competitive sports.The new version of the Luminox Tony Kanaan watch is offered in a larger limited edition of about 999 pieces and each watch will be inscribed with the limited edition number on the back - mine being No 161 of 999.I read that half have already been pre-sold at launch time. (Above) Back design of the watch backing with Tony's signature, race car and serial number inscribed. (Above) Solid construction and carbon fibre design shows off the watch's sporting and rugged design. The Luminox TK watch is retailing at $1694 w GST at major watch retailers and I believe some outlets like Tangs have a credit card promotion of 30% discount off the retail price for UOB card holders. 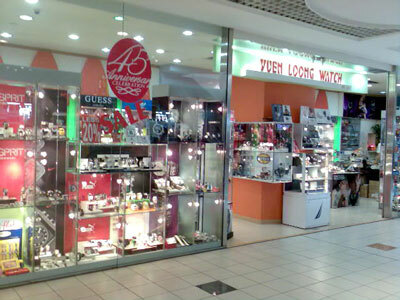 For myself, I managed to order the watch at the lowest price of $1145 w GST through Yuen Long watch located at 03-L1 at Parkway Parade(above). 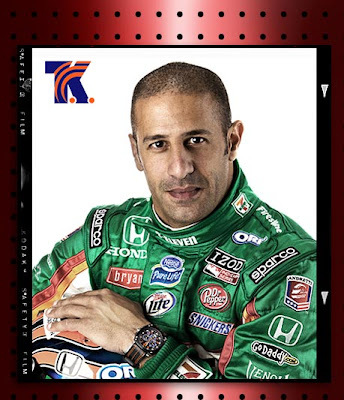 Tony Kanaan (born December 31, 1974 in Salvador, Brazil) is a Brazilian race car driver of Lebanese heritage. He won the 2004 Indy Racing League IndyCar Series championship driving Andretti Green Racing's 7-Eleven sponsored car, winning three times in his Honda-powered Dallara. That season he completed 3,305 laps, making him the first IndyCar Series driver to complete every possible lap in a season. He also led 889 laps in 13 separate races to establish an IndyCar Series record. Kanaan is also the only driver to lead the Indianapolis 500 in each of his first seven starts, though he has yet to win this flagship event. He has a total of 13 IRL race victories. Kanaan was invited by Luminox to design a watch that would become Essential Gear for his active lifestyle. Kanaan is very pleased with the second timepiece collaboration in the partnership. "It was a wonderful experience for me to work on the design and so many details of my watch," Kanaan said. "Design, performance and precision - I almost feel like my watch is a part of me when I wear it." This week, i completed another upgrade to our Golf with the installation by Jimmy CBX of the flat bottomed R Line Sports Multi-function steering wheel(MFSW)together with the OSIR G-shift alloy paddles from Godspeed @ HAT. The steering really adds a sporty touch and the grip on the thick leather stictched steering really helps provide better steering grip and wheel, especially the flat bottomed section. The OSIR paddles can be gotten from Lyonel at 90612014 while the wheel can be gotten from Jimmy at 91777305. 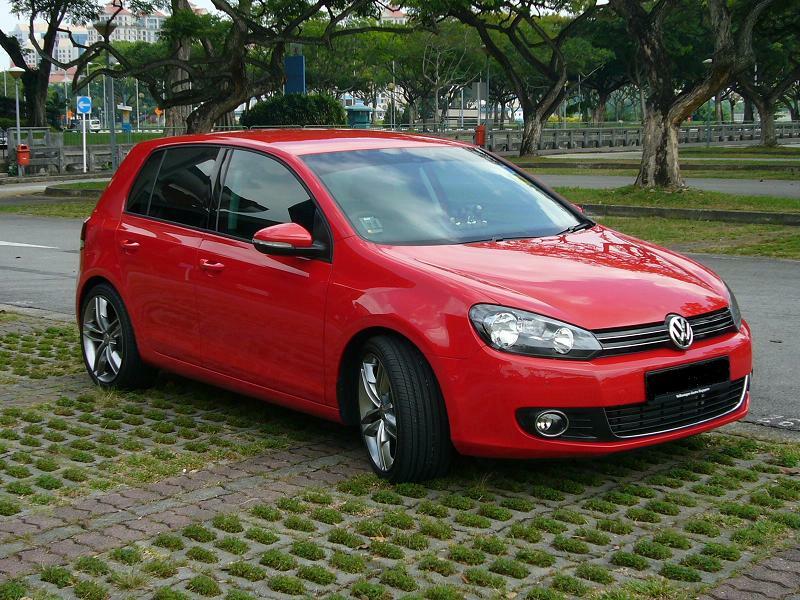 Why VW Golf 1.4TSI over Mercedes CLC? This post in in reply to a few of our readers who enquired why we changed from a Mercedes CLC coupe to a VW Golf Mk 6 Sports. Basically, the Mercedes CLC was a good deal as CnC offered to absorb the loan difference between the sale price and outstanding loan amount of our Mitsubishi 'i'. The CLC was also going for 103k in April 2009 during a weekend promotion which was a great discount from the normal 126k retail price.It was too good a chance to miss and well the lure of driving a Mercedes was a very attractive proposition. After a year, when COE prices shot up, we found that our CLC which we bought at 103k was going for 155k which meant that we could make a profit that could be used to pruchase a new Golf Mk 6 sports which is much faster, more roomy, better drive experience and tremendous kit list surpassing the merc. Besides, 4 doors would be more practical over the long term. As for some readers asking abt the Golf Mk 6 Sports, there have been horror stories about the car breaking down from some owners but these mostly affect the non-sports 122hp version rather than the Sports. Car is reliable.The only minor defect was a clicking sound in the steering wheel which was solved with a new steering wheel replacement. The fuel economy is good. Road tax is only $620 a year since displacement is 1400cc. Insurance is just a few dollars over 1k after 55% NCD. Could be less as i included loading for Gayle as the 2nd authorized driver. Sports mode is infectious with the rev counter climbing rapidly as car zooms from zero to 100km/h in 8 seconds. Car has every conceivable kit from external downlight, auto headlights, auto wipers, lighted footwell, 11 airbags, touchscreen head unit wit hSD card slot ( upgraded to OEM 30GD Hard disk and GPS, Reverse camera ), individual zone climatic control air con, leather sports seats etc. Car still puts a smile on our face! 3 months old almost new Golf Mk 6 Multi Function steering wheel for sale. This steering was newly installed 3 months back by VW Singapore as I made a complaint about a clicking sound in the previous steering wheel. Comes with OEM airbag unit and OEM paddle shifts. Letting it go for $250 as i have just installed Golf R sports flat bottomed steering. Suitable for retrofitting on VW Jetta basic 1.6, Tiguan and New Touran models. Can refer installer to you if you do not know one. Note that you may need to purchase an additional control module and programming from the installer to operationalize the steering wheel. Check with installer. New Golf Mk 6 MFSW going for at least 4 times the sale price so this is a steal. Also available for sale - 6 months old Mk6 Golf Sports Tinted Rear Tail lights for sale. Left and right side - main and accompanying light units at total clearance price of $50.In good working condition as owner has changed to LED Golf R lights. Please email blissndreams@yahoo.com.sg if interested. Prices are nett. Having stayed 3 years in our current apartment, we felt that there was a need to update and refurbish our current apartment for a updated look and to keep pace with new needs. We are very happy with our current location at Bedok South as it is a private HDB estate that is near ameniites like Siglap, the ECP, near a good school -Temasek Primary, coffeeshops, salons, pet clinic and pet grooming, laundry, 7/11 all downstairs and walkable to Tanah Merah MRT and feel we will stay here for long term so we decided to invest in a new look for our apartment. We started with our kitchen extension which was featured in our earlier post which saw our kitchen extended to incorporate more storage space, tabletop space,a glass encased shelf for books and baking items and installation of a built in oven. (Above) Original state of the Kitchen before extension. (Above) After extension of the kitchen cabinet. (Above) Glass display for Gayle's bakery books and bakery items. Next we changed our lights to energy saving lights as the current halogen lights were quite energy consuming in our opinion and gave out heat. (Above)Original halogen boutique light for walk in dressing room. (Above)New energy saving lighting tubes which act as a wardrobe light too. (Above) New master bedroom energy saving honeycomb design pendant light. We like the lighting and shadow effects on our ceiling. After a week of installing the new energy saving lights, we noted a drop in our electricity bill due to a drop of 11 kwh in electricity usage when our bill arrived and this is in December where usually our electricity usage goes up since we are on leave and stay at home more during this period. We plan to divide our current relaxation room in the future with a dividing feature wall and made the first preparatory stage by repositioning the light point and including an additional light point. The addition of an extra lighting point and light also required us to purchase a 2 gang light switch from the Legrand Milla range(below) to replace the current 1 gang light switch. (Above) Original lighting point in the Relaxation room. (Above)Installation of extra lighting point and pendant light and shifting of lighting point. Our next step after the kitchen and lightings was to remove our curtains in the hall and replace it with contemporary roller blinds. Curtains are difficult to clean and previously when Shayna was infested with ticks, we were advised by Rentokil, the pest company we hired to detick our apartment to remove curtains as they are a good source of hiding spot for ticks, fleas and bugs. So with the curtains out, we contacted Chicks and Blinds Decor to install our glossy black roller blind. (Above)Black gloss roller blinds add a modern touch. We like the thin blackout material of the blind fabric and the smooth pulley system. At the same time, we hired Colourland to repaint our house using NIPPON paint and apply oil-based sealant to keep out mositure on the wall due to condensation of walls in air-conditioned rooms.This was the main reason why we got inspired to repaint our apartment as there were alot of water condensation marks over the 3 years. We chose interesting colours of a combination of spellbound red and galaxy grey for our hall and master bedroom, lime green for our relaxation room now renamed Blissndreams room, white for common areas like the kitchen, wash area, black for the toilet ceilings, combination of yellow and purple for the study and walk in which really help brighten the room. After the paintjob which took two days, we hired Modishop Design to customise decals to rejuvenate our bedroom glass doors to give a fun look to our contemporary home. All in, our apartment looks better than before and we are pleased with the results! (Above) Hall and dining area of spellbound red and galaxy grey. (Above) Galaxy grey dark tone brings out the play on shadow by our avant garde clock from XZQT. (Above)Purple for the entrance to our storeroom. (Above)Bright yellow for the study to brighten it up since natural light is blocked by the walk in wardrobe behind. (Above)Combination of purple and yellow for the passage to the study. (Above) Purple for the vanity area of the walk in space and entrance to master toilet. (Above)Yellow for the study and passage leading to walk in space. IKEA wall mirror helps to make the space bigger. (Above) Shayna supervising the guys from Modishop who were putting up our decals for our glass doors. (Above) Our customised decal on our bedroom doors. (Above) Our rejuvenated living area.